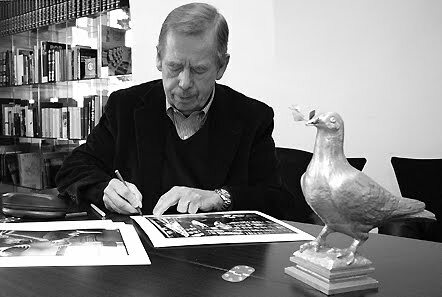 Vaclav Havel, who was born poor, became a pundit, then turned playwright, wound up a political prisoner, and ended up president of the newly-free Czech Republic following the Velvet Revolution that precipitated the fall of the Soviet Empire, has passed away at the age of 75. Havel lived the kind of life that would have been hard to believe, had it not really happened. Yet for all of it he maintained an intense sense of humility. I've heard stories about how when he was president (a job he did not want at all) that he would often show up unescorted at pubs to discuss matters with his fellow Czechs, as well as popping up unannounced at historic sites to serve coffee to tourists. Havel did not like being a politician. And I'll dare not sully his memory by referring to him as such. He was, instead, a sincere statesman in every possible sense of the word. Thoughts and prayers going out to the family of one of the greatest leaders of the past half century.